General Description: The Rowan point is a small to medium sized dart point with wide side notches and a straight to concave base . Notches are large and ground on both faces. The base is also ground. In some examples, the notches are extremely elongated and shallow with slight shoulders and prominent tangs or ears / auricles. The blade edges are straight or convex and sometimes serrated. The distal tip is acute or pointed. Nearly all examples have a flaked bevel on at least one blade edge. Some specimens are flattened with a flaked bevel on three or four edges. In addition to ground notches and base, the tangs are always thoroughly ground and rounded or somewhat pointed. Most tangs and tips are quite thin. Many examples are lightly ground over the entire hafting area on one or both faces. Rowan points are made by random percussion flaking with secondary retouch. Beveled blade edges are steep or shallow and are often made by fairly good parallel oblique flaking over random flaking. Bases are thinned by removal of several vertical parallel or random flakes followed by grinding which obliterates some or all of the signs of flaking. Notches are formed by removal of several percussion flakes followed by grinding that leaves few flake scars. The Rowan point ranges from 38 mm to 55 mm in length. The width at the shoulders ranges from 20 mm to 30 mm. The basal tangs range from 23 mm to 33 mm wide. The notched stem ranges from 13 mm to 25 mm in width. Notches range from 9 mm to 15 mm long and 2.5 to 8 mm deep. The distal tip is thin 2 - 3 mm as are the tips of the tangs. The Rowan point is usually made from chert, rhyolite, silicified shale and quartzite . The Rowan point type has been found in North Carolina, South Carolina, Virginia, Georgia and Florida. According to site reports, similar points have been found in other southeastern states and even into the Ohio River Valley. The Rowan point type has not been formally dated but they have been found in one poorly stratified site associated with the Kirk Corner Notched, Lost Lake, Big Sandy type I and Palmer points. In another poorly stratified site they were also associated with the Palmer, Quad and Hardaway Side Notched types. On the basis of morphology , technology, and provenance, the Rowan points are assigned to the Early Archaic with an estimated date of 9,500 - 8,500 B.P. and may continue forward into the Middle Archaic period. It is believed that the Rowan point type is technologically related to the transition stage of the Dalton-Meserve, Quad and Hardaway forms and into the Early Archaic corner-notched and side-notched forms. Like any transition form of point, the Rowan possess features of antecedents and decedents. Joffre Laning Coe's Halifax point type (1964, The Formative Cultures of the Carolina Piedmont, Transactions of the American Philosophical Society, Vol 54, Part 5, Philadelphia) seems to be related to the Rowan but appears much later in the Middle Archaic period. 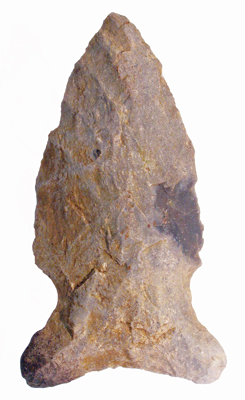 The Rowan point type was named and described by Peter P. Cooper II for examples he found in Rowan County, North Carolina and published in the Central States Archaeological Journal, Vol. 17, No. 3.